There are many techniques to make pottery from most commonly known potter’s wheels to clay slip casting processes. 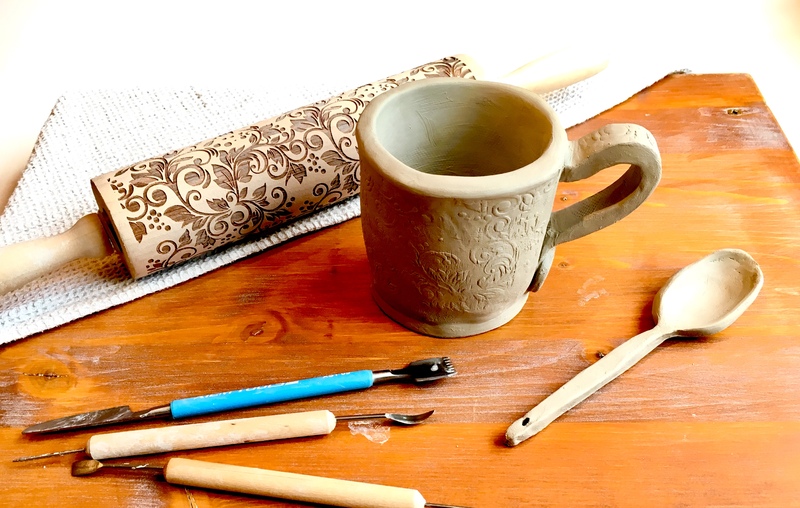 Here at crockadoodledo I’d like to introduce you to our clay workshop by using slab clay to hand build unlimited pottery from plates, bowls, mugs, butter dishes, cake stand, jugs…and more! Hand-built pottery gives you an easy entry to the world of pottery making. This 2.5 hours workshop is suitable to participants with no previous experience or for those seeking further development of hand building pottery without a wheel. Slab will be used to create and decorate a patterned mug and spoon. A complementary drink is included in this workshop. Every Wednesday and Friday we offer hand build pottery workshop, this can be up to 4-6 people for one group session. We can do private workshop on Saturday/Sunday if you are a 6 people group. Please do book ahead if you like to potter about! This is what you’ll make! 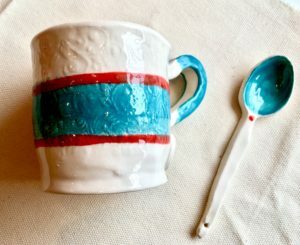 You can paint your mug and spoon a different colours!